Click on the post-it for booking information. Integral NLP offers accredited high quality Neuro-linguistic Programming (NLP) Diploma, Practitioner and Master Practitioner qualifications within the counties of Worcestershire, Gloucestershire and Plymouth, Devon. In addition to the standard price, there are six subsidised places available annually for self-financing and self-employed individuals. Please apply to Kim if you are interested in taking one of these six places. Integral NLP also offers short NLP, Meditation, MIndfulness, Enneagram and Myers-Briggs® courses together with one-to-one consultations and coaching. These consultations can help with numerous life issues from phobia cure, anxiety and stress reduction to performance enhancement and goal achievement. Integral NLP's mission is to offer quality, affordable and ethical NLP training and consultations to those dedicated in continuing their personal and professional development. Integral NLP offers a range of courses to support the beginner, intermediate and advanced student of NLP. "Kim is dedicated to helping you on your personal journey of growth, happiness and empowerment." The courses are accredited by the International NLP Trainer's Association (INLPTA) which is one of the top International Schools of NLP. INLPTA is respected and recognised throughout the world by the NLP community. Kim has professionally trained with INLPTA and click here to see why you may wish to take your training with Kim. The NLP Diploma, Practitioner and Master Practitioner courses are run using monthly weekend modules which can be taken as stand-alone weekend courses if you prefer. 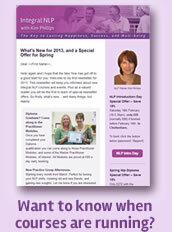 There are also Short NLP Classes within the Gloucestershire and Worcestershire areas. The application of your learning is encouraged throughout the training by teaming up with your colleagues to practice your skills. After your training, Integral NLP is committed to your Continuing Personal and Professional Development through the use of NLP Practice Classes. 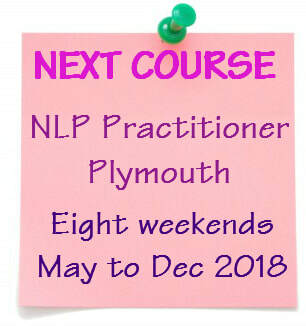 Plus you can repeat courses for a small fee (places are limited to two per course) and through assisting on NLP courses. Integral NLP is now in its fourteenth successful trading year and is headed by Kim an experienced, professional NLP trainer known for her relaxed, approachable and intuitive style plus her extensive knowledge of NLP, transpersonal psychology, the Enneagram, the Myers-Briggs Type Indicator®, mid-life development and healing through the Human Energy Field. Click here to hear Kim's philosophy. 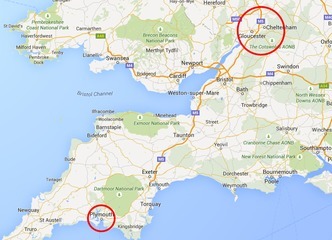 Courses in Gloucestershire, Worcestershire and Devon.